With the Spring season literally upon us, I know, I know it doesn’t quite feel like it is upon us what with this delightful weather gracing us, but my mind is for all intensive purposes in the floral’s and pretties zone. I’m done with dark and dank and layer upon layer of fabric. I’m craving splashes of bright colour and pretty prints and a touch of fun that only comes with sunshine (winter = no fun). I find with simplifying my wardrobe the best way to inject some oomph is via the accessories. Fun, easy and can be as cheap or expensive as you can afford. It’s a lovely easy way to update any outfit and bring it up to date. Plus accessories shopping is the best. Bags don’t judge if you’ve gained a few pounds and they fit regardless.. thank god for lovely bags I say, as this body is faaarr from bikini ready. And when I say far I `actually mean never. Never ever ready. With an update in mind (that’s especially not bikini shaped, no surey bob) I got to thinking and a looking as to what kind of bags I would like in my life this spring and summer, the practical, the fun and everything in-between. I set off to my usual stamping ground of Lyst for some inspo and ideas. Great place to read up the bag edits and to see what’s ‘in’ for the season. So after much (way too much) research, here we have my Spring Summer Bag Edit. My favourite type of bag, as it enables the all important hands free when out and about. Crossbody bags are vast and varied. you can have slouchy or structured, neutral or pop of colour. For me this season is all about the pop of colour with my crossbody. 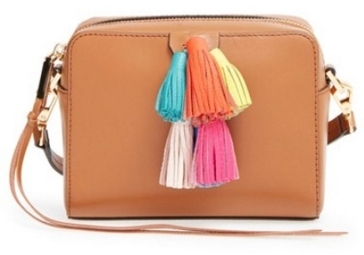 I absolutely love with all my bag loving hear this Rebecca Minkoff Mini Sofia tassel bag. Tan neutrality which is perfect for summer, but with the added magic of the tassels for that little fiesta of colour… Isn’t it divine? I will also be constantly using my Red DKNY mini bag which I love for adding a pop of my favourite colour. People will often think that red is a winter colour (or save it for festivities such as Christmas or valentines) but it’s such a great trans-seasonal colour, it works well all year round. If you don’t fancy red, orange is a great alternative, I have a beautiful bright orange Fossil bag I pull out each Spring and love, pair it with khaki, denim, all the neutrals, and pretty much anything. It just works. And finally the trusty black crossbody. When all else fails you, a classy chic little black number will never fail you and of course you’ll get years of wear with it. My absolute favourites are by Marc Jacobs and Kate Spade, soft leather, unstructured and a little slouchy.. Lovely! Here we’re talking holdall’s for weekends, tote bags, backpacks and shoppers, general carry everything bar the kitchen sink around with you, type bags. 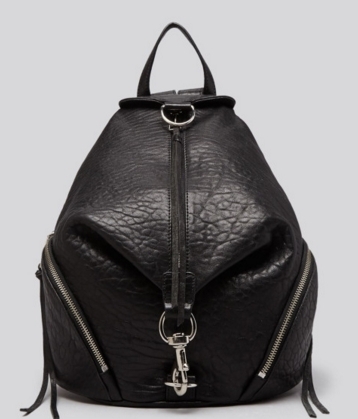 I’ve said it before and I still am yet to invest, but this year I will be sporting the backpack. Yes I am returning to my youth with sneakers and now the backpack. Full on Dora the explorer style (to the point where all I can hear in my head is that irritating song “Backpack Backpack” a la Dora) But yes for practical reasons, summer holidays etc, I am investing in the backpack. Wet wipes, snacks, random lego can all be chucked in and my hands can still be free to grab small children and assist where needed. Why have I not thought of this sooner (and previously rammed way too much stuff in to an inappropriate cross-body bag)? Again my preference is the Rebecca Minkoff Black Julian (Rebecca Minkoff is KILLING it on the bag front!) which is the beauty above. Julian, you shall be mine!! Other bags for the season include a pretty blush tote that would be a lovely addition, the idea of blush as a summer neutral is such a great update, Kurt Geiger has some pastel pretties that really just scream Summer at the top of their pretty little voices. 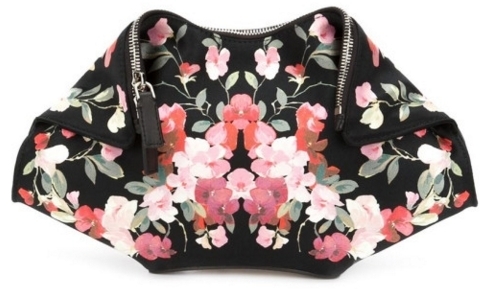 Now, if I were to live off beans for the foreseeable and I possibly wanted my husband to get really really mad at me, I would go for the beautiful Floral Alexander McQueen De Manta clutch, slightly pricey for a clutch that you may drag out a couple of times a month, but wow… What a piece right? On the more purse (or clutch ..snort..) friendly price range, a little jute number is summer personified, add some embroidery and a tassel and you have beach to bar perfection. Mango Clutches are wonderful for this and they have a vast array or colours ans styles that I hope to bag (ha, I just can’t help it) for myself this summer. House Of Fraser also have an array of lovely clutches too. So there we have my weapons of choice for the summer. I shall be investing over the next few weeks! What bags will you be buying this summer? Love all of these choices!! That leopard bag is amazing! Love all the colors and different styles! Thanks so much for linking up with Style Perspectives today!